Where are the art shops in Paris which actually provide artists supplies and materials? This post attempts to answer that question - and provides me with a list of ones to try and find. I finally found the trick to finding out where art shops in Paris. First you need to go to Google France and then put in your query - which need not be in French to start getting results. The trick is finding the search query which does not generate lots of galleries. I used "art shops Paris" to start with! 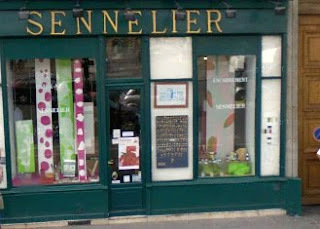 Sennelier Art Shops (French website) There are three shops at 3 quai Voltaire 75007 Paris / Magasin do 4 Bis, Rue de lar FGrande Chaumiere, 75006 Paris / Magasin du 6 rue hallé- 75014 Paris. 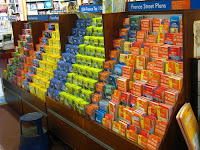 This is a very nice review of a visit to the shop and this is a Flickr photo of the pastels in the Sennelier shop! It stocks Caran d'Ache Luminance but these seem to be only marginally cheaper compared to the UK. Berthelot Sarl 184, Rue Faubourg St Honoré, 75008 Paris, France. I've not been but it look like it might be a bit like Cornelissens. This is a review posted on Google - although I have seen another which said something rather different. Just have a go at translating this French! Graphigro has shops in the Third (13-15, boulevard des Filles du Calvaire ), Sixth (207, boulevard Voltaire ) and Fifteenth Arondissements. ArtStage.Fr has a great basic list of art shops. I love visiting gardens and intend to visit gardens in Paris. 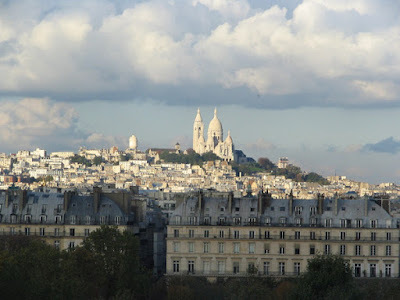 Here's a short list - with links to Wikipedia - of woodlands, parks and gardens in Paris. I'm unlikely to get to more than two or three but will be trying! 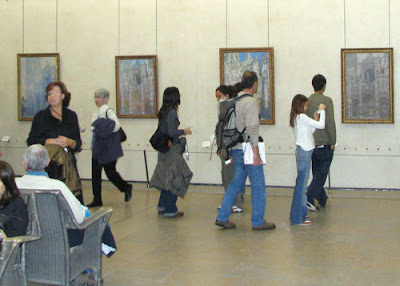 One of the things I know I will be doing in Paris is visiting various museums and art galleries. TIP: Pay careful attention to websites or guide books as to the days on which museums are closed. They don't all close on the same day but they do all somehow manage to close on one of the days you've decided to be in Paris! Check before you visit to avoid disappointment. National Museum of Modern Art - Centre Georges Pompidou (aka the Pompidou Centre by the English and the Beaubourg by the locals). Besides being a very spectacular building the Pompidou Centre houses one of the world's leading collections of 20th century art of c.53,000 works. You can take a virtual tour via the website. Musée de l’Orangerie is located at the Place de la Concorde end of the Jardin des Tuileries. Last time I was in Paris there was a major exhibition at the Grand Palais. We were queuing out the door and round the foutain to see the blockbuster Turner, Whistler and Monet exhibition! The building was home to the 1900 Universal Exhibition. Currently it's home to the Renoir in the 20th century exhibition. Just opposite the Orangerie is the Galerie de Nationale du Jeu de Paume: This is another national gallery and is a museum of photographic art. It's located in the north-west corner of the Tuileries Gardens. The Picasso Museum opened to the public in 1985. Devoted solely to Pablo Picasso (1881-1973), the museum provides a unique opportunity to follow the artist's development throughout his career from 1894 to 1972. The collection was started with the works that the French State received in payment of death duties. it was bequest with 251 paintings, 160 sculptures, 16 collages, 29 relief paintings, 107 ceramics, 1,500 drawings, 58 notebooks, and his entire engraving works complete with the various stages of each plate and illustration. Over 100,000 archive items, photographs, letters, manuscripts and documents make this the largest and most comprehensive collection of Picasso's life and work in the world. Paris is one hour ahead of London so by 11.17am we should be arriving at in the busiest station in Europe. We'll then be walking some fifteen minutes to our hotel in the ninth arondissement - I'll be reporting later on whether I can recommend it. It looks promising and it took an awful lot of browsing of the options before I found it! After which the sightseeing - and the sketching starts in earnest! Today, we're starting our trip to France. If you're interested you can take a virtual trip to Paris, Normandy and the Loire valley with us as I've arranged for a post to publish each day on this blog about where we are and what we might be getting up to! I'm not trying to 'go digital' for the trip so sketches and photos from the trip will be posted when I get back - much in the same way as I've done for previous trips (see Venice, Italy (May 2005); California, Arizona & New Mexico (July 2006); Massachusetts, New Hampshire, Vermont & Maine (September 2006)). Both sets of posts will include travel tips as this is a travel blog as much as it's a sketchbook blog. Tip: I booked over the phone as we were doing two different types of ticket (one return and two one-way) and you can't do different combinations for the same party online. I ended up with two different references for adjacent seats. I was able to print my Eurostar return ticket off using my own printer. However as a mistake was made by the booking people on the other ticket and this was remedied but this then meant that it couldn't then be printed off online and the tickets had to be posted to me - in the middle of an ad hoc postal strike! Moral of the story - if you book over the phone and discover they have made a mistake, get them to cancel the whole ticket and start again if you want to print off rather than wait for the post! Please do comment - but it's unlikely your comment will be published until I have the time and can also get access to a trustworthy computer to moderate comments - which might not be until I get home again! I'll be tweeting during the trip - but only those who have signed up to follow me already can see those tweets as I've protected my Twitter stream for the duration of the trip. Sorry to be boring (and this is not an exercise in trying to collect followers) but I'm just trying to minimise the incidence of 'weird' people following me because I'll be tweeting about popular places. 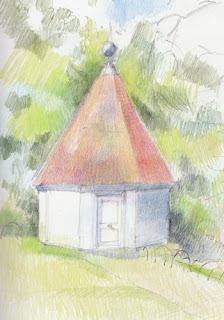 In the corner of the Orchard at Sissinghurst is a Gazebo. It's not been there very long, having been constructed in the late 60s which means it's celebrating its golden anniversary this year. This is what the National Trust has to say about it. The Memorial Gazebo at Sissinghurst, built of Kentish weatherboard, was dedicated in 1969 to Sir Harold Nicolson (husband of Vita Sackville-West) by their sons, Ben and Nigel. It stands by the moat and was used by Nigel Nicolson (who lived at Sissinghurst from 1930 until his death in 2004) as his private writing room. There are windows on the moat side which look out at the fields beyond Sissinghurst Castle garden. Where to go on my French trip? My name is Katherine and I'm a mapoholic. I love maps. I collect maps. I have shelves for maps. I frame antique maps. Basically I'm just an unrepentent mapoholic. So, when visiting a country I'm not likely to just go and buy one map. That would be too simple. There are of course merits to maps at different scales. Plus of course they have different boundaries. Then they have different graphic treatments - which tend to make them more or less easy on the eye and accessible in terms of interpretation. Plus they tend to have different purposes, ones for driving, ones for finding your way round a town or city and ones for being to locate streets within a town or city, ones for using public transport, ones for finding museums and ones for finding the shops! Which is a long way round of saying that when travelling with a sketchbook abroad, the maps come too! 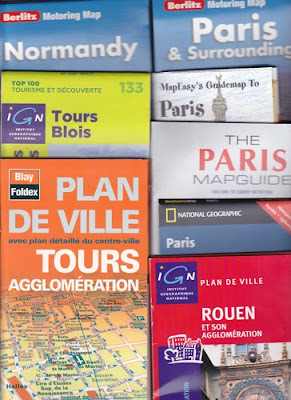 I'm going to be visiting France in the near future - and needed some maps. Stanfords (in Long Acre) have rather a lot of French maps from which to choose and I spent rather a long time in there last Saturday afternoon. After all, if it's good enough for customers as diverse as Shackleton, Bill Bryson and Michael Palin it's bound to provide me with what I need! Below is the route map of where we will be visiting and the maps top right are part of my haul! then two days "doing a Monet" - with a visit to Monet's garden at Giverny followed by an overnight stay in Rouen. I'm rather proud of the fact I've managed to get booked into the hotel which is bang opposite the front of the cathedral - so I'll be up early that morning and out sketching in the early morning light - "doing a Monet"
or a great place to visit? I'm particularly interested in locations from which to sketch - where are the good views? 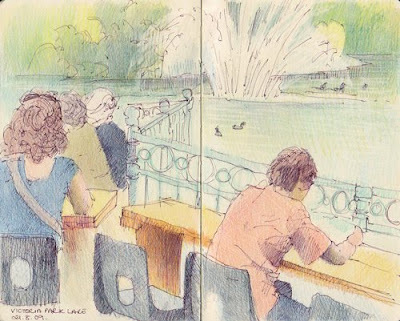 I'm not quite sure why but I last posted sketches of people by the West Lake in Victoria Park in January. I sketch the people on the terrace by the cafe next to the West Lake in Victoria Park when I stop there for my cup of tea on my morning sketchercise walk. It rather depends on whether or not I get distracted by the trees or the birds and sketch them instead! I guess the trees and birds got more interesting as the year progressed! Here are the other three from January this year - when it was very cold. There are fewer people around in January and I always sit inside to sketch - with my hot cup of tea! The people who gather on this spot are interesting. They often seem to be under the misapprehension that if they you sit outside near a fountain you can't be overheard! While sketching I find I hear snatches of conversations into the sketches without even trying - I often think I ought to try and incorporate some of the words into a sketch. I had to go to Outpatients on Monday - so naturally I took my sketchbook! 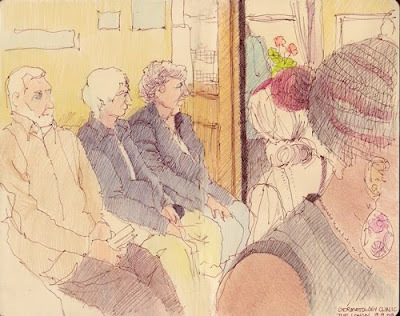 Waiting rooms always provide an excellent opportunity to draw people - people come and go all the time - it makes a for a nice challenge. I often spend my time noticing how many commonalities we have (the ladies in their navy jackets) while all being slightly different. What's really great is when you notice somebody who stands out. Here's the view from my seat in the waiting room - I just loved the dark magenta bun of the lady who was sat just in front of me. It brought the phrase 'top knot' to mind as she had taken her beautifully braided hair and gathered the ends into a bun. Sumo wrestlers with sekitori status are allowed, on certain occasions, to wear their hair in a more elaborate form of topknot called an oicho or ginkgo leaf style, where the ends of the topknot are splayed out to form a semicircle. Given the uniqueness of the style in modern Japan, the Sumo Association employs specialist hairdressers called tokoyama to cut and prepare sumo wrestlers' hair. This is about sketching a view of the Cottage Garden at Sissinghurst and shows you my 'before' and 'after' versions of the same sketch. 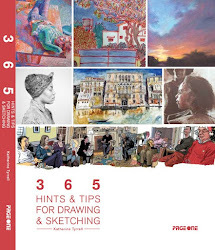 It also provides some tips for sketching within a time limit. 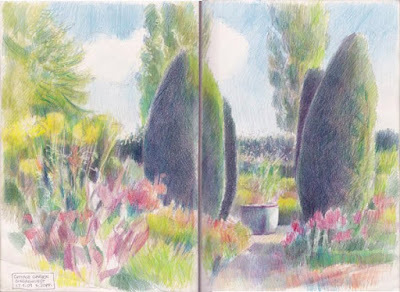 This particular sketch was done right at the end of a trip to Sissinghurst in August. "He who must not be bored while I sketch" read his book sat in the chair outside the cottage while I sat on the doorstep. 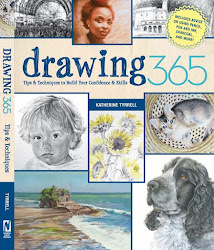 I also tried out my latest addition to my sketching toolkit which I'd bought earlier at the shop. This is a foam kneeling pad for gardeners. It fits neatly inside my backpack and makes a perfect lightweight pad for use when wanting to sit on the ground to sketch. The sketch at the top is how it ended up - it's a sketch of an early August evening which means lots of lovely shadows and a warm quality to the light. I love sketching in the early evening and do it a lot as places often look much better than in the middle of the day. However in this instance it was the end of the day and consequently I was very limited by how much time was left before the garden closed at 6.30pm - and below is how far I got while still in the garden. Below I'll tell you what I do if time for sketching is limited - and what I did to help me finish this sketch back at home. I start a lot of sketches - but don't always finish them. Some are rubbish, don't deserve to be finished and never see the light of day again! However other sketches are only starts because I'm working within a time limit and consequently cannot finish them properly. I can finish promising sketches back at home if I make sure I do a few things - which I'm sharing with you below. contour drawing - shapes and lines: focus on drawing in the big shapes and getting the junctions between important lines/shapes right. Forget about the details - there are more important things to do! I tend to look for the 'big' verticals and horizontals and any important diagonals eg any lines which lead the eye into the picture. get the rest of the colours down ASAP: If you do a lot of sketching and train your brain to observe, name and record colour then it's possible to do memory sketches - so long as you get the colour down fast. I find I've got to be very careful about this if I'm doing a day's sketching as all the colours in the different images can get mixed up in my memory. I find that my best bet for colour sketching from memory is always the last sketch of the day - as this was. While I printed off a photo to check my proportions and shapes, I used my colour memory to complete this sketch and capture the early evening light. I think it worked quite well for the most part. There are bits I'd like to improve on and I may well have a go at working this one up info a more formal drawing. Below you can find some links which provide helpful information if you want to draw or paint gardens and/or visit Sissinghurst. 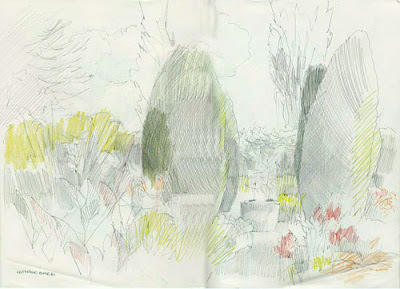 Plus links to previous sketches at Sissinghurst. sketching within a time limit? Sissinghurst Castle Garden - a great garden - my information site about the garden at Sissinghurst. After sketching at Seven Dials I walked down to Neal's Yard which is nearer Covent Garden. In fact it's about a couple of minute's walk from both Seven Dials and Covent Garden Tube Station. A small alley between Shorts Gardens and Monmouth Street opens into Neal's Yard, a small courtyard which is a slightly hippy home to healthy food (eg Neal's Yard Salad Bar and Neal's Yard Deli - which is the purple and orange building to the right of my sketch above); natural remedies (Neal's Yard Remedies) and other new age type shops - mixed in with beads and back rubs! As you can tell having Neal's Yard in the name has some cachet! The colours are a refreshing change - although trying to cope with quite so many complementary colours at one and the same time slightly overwhelms the eyes. 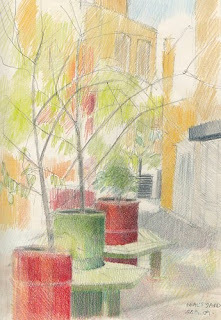 I sat at the Souk end and then went and sat on the bench outside Neal's Yard Remedies (on the left of the sketch at the top) and drew the view of from the other way on - of trees in coloured bins and the green seats which surround them - against the inevitable acid orange painted brick walls! On the way out I paid a visit to Neal's Yard Dairy - to sniff the cheese - as I'm not allowing myself to eat cheese at the moment (diet!). The top sketch didn't look right when I got home and I realised that in trying to work through the complexities of the pattern of horizontals and verticals PLUS all the local colours I'd completely lost the value pattern which had attracted me to the view in the first place. A little bit of attention with an eraser to pick out the lights and reinforcement of the darks with my pencil and my sketch was looking much more as it should do. 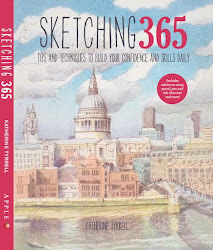 Sketchercise: there was a fair bit of trekking around - but sketching in central London doesn't rack up the distances as much as walking in parks and alongside canals and rivers! 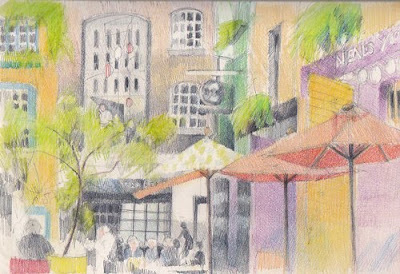 Last Friday I was on a sketching trip to Seven Dials near Covent Garden. It's a curious place. Initially you think of as being the place where there's a road junction of seven roads - with a great big Sundial Pillar (it has six sundials) in the centre. That's now a place where people like to take time out, and - as is the way of the world these days - check out their messages and text their friends on their iphones and mobiles! However Seven Dials is also a thriving community within central London - of which more below. This sketch was actually done in my panoramic sketchbook and the pillar continues up the page. However I quite liked this crop when I did the scan so that's what you can see! I'm currently mulling over making this into a proper drawing for an exhibition next year. Seven Dials - the area around the junction - was once a notorious place. I first came across it in Agatha Christie's novel The Seven Dials Mystery (1929). Seven Dials was orginally created by Thomas Neale MP and was planned as a fairly up-market development. 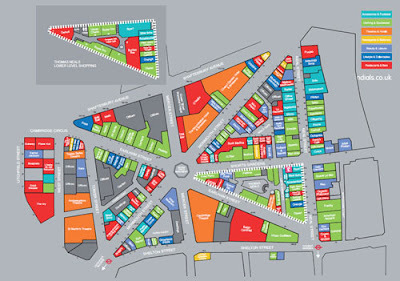 The design of the Seven Dials development - the seven roads fanning out from the central pillar was ingenious and addressed the nature of the site layout and the financial commitments which went with it. As a result there are several passages and small court yards in the surrounding streets. Initially the residents were respectable, if not aristocratic, comprising of gentlemen, lawyers and prosperous tradesmen. However after Neale disposed of his finanical interest in the development in 1695, the rest of it was carried out by various builders over the next 15 years. They sub-divided the houses which in turn led to a very different sort of inhabitant from that originally planned! by the middle of the 18th century, the area had 'declined' to the extent that 39 night-watchmen were needed to keep the peace. By the early 19th century the area became famous, together with St. Giles to the north, as the most notorious rookery (slum) in London. Latterly a lot of money has been spent on regenerating the area. It became designated as an Outstanding Conservation Area (only 36 existed out of 6,000 in the UK) and then gained Housing Action Area status in 1977. This brought back into use every vacant residential property and also encouraged major private housing schemes and new businesses. The replacement sundial column seen today was constructed in 1988 and 1989, to the original design. It's now a sustainable community, has good shops and is a very trendy area! Members of Sketchercise have recently been learning how to produce maps of our routes using Google Maps - so that we can see the places where sketches are being done on our travels with a sketchbook. Now - so that I don't forget how to do it and also so I can make a record of my tips for myself I'm sharing what I do to create a map. I think I was successful on my third attempt - hence the tips section! find Google Maps - it's usually a link in the top left of the Google Home Page. Watch this Google video tutorial about how to create maps on Google Maps. This explains about creating a new map and including placemarks and lines for your route. The huge benefit for sketchercisers is that it tells you how far you've walked at the end of the route! His images in Picasa are public and hence can be located on the map. What's the map about - Use the title and description to say what the route is about if you want to be able to keep your chums aware of where you have been walking and sketching. Use the right line tool - If you're going to be walking across open land you can't use the 'draw a line along roads'! Don't give up! - I found it quite difficult to get the 'draw a line' tool to start. Persevere - you'll get there in the end. Achieving accuracy Tip #3 - Use lots of clicks for the 'drawing a line' tool for the route that helps get its 'shape' right. I started to find it was useful to click every time the route started to bend in shape. 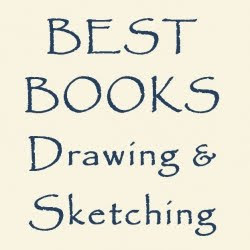 Show where you did the sketch - I use placemarks to note where I did a sketch. I then use the rich text of description to include a link to my blog post. Obviously the description also gives scope to indicate which direction you were looking in, what the weather was like etc and/or how long you stayed. Concise descriptions - The description in the placemark list only shows the first line - so you need to be fairly precise with the words used in that line, for example "This is where I did my sketch of..."
Public or unlisted? - You have a choice about whether you make your map public - or only available to those which have its URL (ie it's not listed by Google). I'm sticking to the latter. Privacy - One important thing to bear in mind. If you don't want to share your address on the Internet do what I do and use a fixed point near your home to act as a start and end point. I'll also be varying mine! I'm going to be coming back and updating this post as I find out new tricks! What are your tips for creating a Google Map of where you've been sketching?